Some books being torn, tattered and dog-eared are all the better for it. It lends them character. When travelling to a different country or even to just a different town, I always try to seek out any second-hand bookshops or charity shops as there's no way of knowing what book (or books) might be waiting there. You never know what might be found. Occasionally I might come upon a book in one of these places that I'd quite like to read but it will be damp-stained and thoroughly worn out so I choose not to buy it simply for the fact that I don't want it in my house. I have my standards. Sometimes a book can be found, however, and though its pages might be loose and its cover torn I would still buy it because the damage lends it an unknowable history. Where has it been? Where has it come from? Who else has read it? How did it end up here? I worked once for a prestigious wine company called Avery’s of Bristol and there I was taught that wine is a living thing that should be respected, be it the cheapest bottle from the shelves of Lidl to the most expensive from the cellars of Andrew Lloyd Webber. The same philosophy is one that I've always applied to books, that they're 'living' things to be respected and like wine they can age, some for the worse but some for the better. 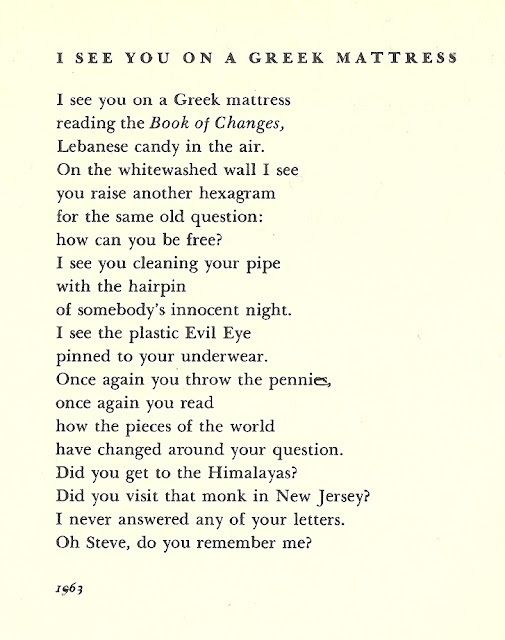 The copy I've just read of Leonard Cohen's Poems 1956-1968 is in a beleaguered condition but I don't mind. I guess that new, shiny copies can still be purchased on Amazon or some such place and there's nothing wrong with that and nothing wrong in getting a copy from there. But a copy from Amazon may look new, it may smell new, it may be pristine but it won't, however, come with a history. I've never understood Leonard Cohen being criticised for being 'depressing' or for making music 'to slash your wrists to' as I've always found his songs to actually be beautifully uplifting, often serving as a genuine antidote to melancholia. And if Leonard is meant to be such a depressive then how come he's always been such a ladies man? He's always interested me has Mr Cohen, not only for his songs but for the whole way he's lived his life. In 1960, for example, he bought a house on the Greek island of Hydra and that's where for the best part of the next seven years he remained; writing his songs, his books and his poetry. I've been to Hydra and it is indeed a very beautiful place. Very rustic, with no cars allowed there and hundreds of cats everywhere. 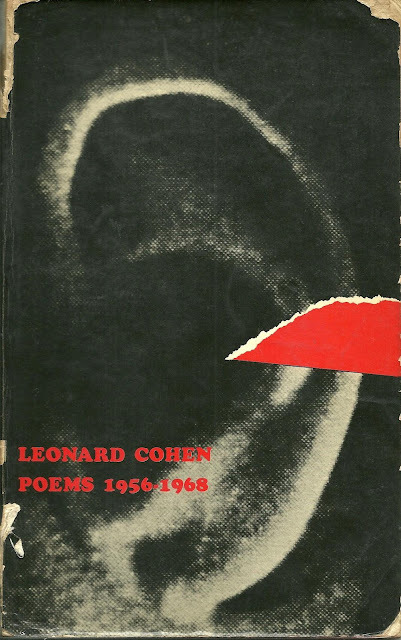 Could this copy of Leonard Cohen's book of poems have come from there? It's possible and I like to think so. Although not all of the poems would have been written in Greece, a good amount of them would have been and you can tell. If you have any affection for his songs then these poems will also appeal. Plato said: "At the touch of love - everyone becomes a poet" and if that's the case then Leonard Cohen is a man forever in love. "You tell me that silence is nearer to peace than poems," he writes in Gift "But if for my gift I brought you silence (for I know silence) you would say 'This is not silence, this is another poem' and you would hand it back to me." For myself, one poem in particular struck a chord going by the title I See You On a Greek Mattress because I too (coincidentally whilst living in Greece) once knew a guy called Steve who I used to really like but have now long lost touch with. And I too have had dealings with the I Ching, again (coincidentally) whilst living in Greece. A lot of books that I read, once I've finished them I tend to donate to a charity shop rather than keeping them because I always feel that books are meant to be read and not just left on a shelf to gather dust. This one, however, I think I shall keep. A poet to the depths of his soul. I'm pleased that you acknowledge him as well, Mr Bear. I applaud you and I salute you.